Vanilla extract appears in so many sweet recipes that it’s almost automatic to add it in when you’re making cookies or cakes, so when you see the words “vanilla extract” replaced with “vanilla bean paste” you might have to do a double take before you realize that these are quite the same thing. Vanilla extract is made by infusing vanilla into alcohol , which bakes off during baking leaving the vanilla flavor behind. Vanilla bean paste is made by infusing vanilla beans into a thick, sweet syrup made with sugar, water and some sort of (usually natural) thickener. The primary difference is that the vanilla beans are scraped into the paste, so you get all of those lovely little vanilla bean specks in whatever you’re baking along with the vanilla flavor! Vanilla bean paste can often be found at specialty stores, like Williams Sonoma, and you can find it online easily, as well. It can be used in place of vanilla extract in any recipe. I particularly like to use it in things like vanilla ice cream, white cakes, and homemade marshmallows, where you can really see the specks of vanilla contributing to the great flavor of the finished product. Just had an ice cream class at Sur La Table where we used this. The chef teaching the class said it’s useful in recipes, like ice cream, where you would normally steep a vanilla bean a while to infuse flavor. Using vanilla bean paste is a shortcut that allows you to skip the steeping step. I bought my first bottle of this vanilla bean paste a few weeks ago and quickly fell in love! I’m never going to want to go back to regular ol’ vanilla extract. 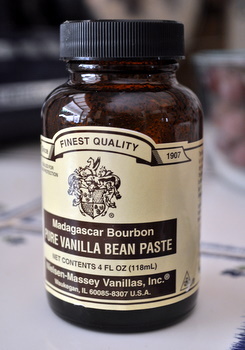 I think I’m going to find some of this and completely discard my vanilla extract! It seems like it would be much better! Sonoma Syrup has a nice extract called Vanilla Bean Crush. it has bits of vanilla in the extract that give things that vanilla bean look. Occasionally I find it at Tuesday Morning for a good price. If you can’t find paste or prefer extract, that’s another option to get those flecks of vanilla in a recipe. Is it an even swap out, measurement-wise? Sounds like this is something I’ll need to get. Is the substitution of paste to extract 1:1 (you’d use the same amount)? I love vanilla bean paste 🙂 it makes my vanilla bean frosting soooo good!! I did a side by side comparison lol made a batch of vanilla frosting… half with pure vanilla extract and half with vanilla bean paste. The vanilla paste was the pure winner with a smooth flavor, the extract had a bit of an alcohol bitterness. I friend of mine sent me a wonderful vanilla bean paste from London and I loved it, Nic – I’ve been using it a lot and it works beautifully. Thanks so much for explaining the difference between paste and extract. I’ve seen vanilla bean paste in the King Arthur catalog but never really knew what it was. Might have to add some to my not-quite-perfect pantry! For those who asked about substitution ratios, it is 1 : 1 : 1 (Vanilla Bean Paste : Vanilla Extract : Vanilla Bean). I love vanilla bean paste for panna cotta, Bavarian cream, Creme Brulee, ice cream, and Blanc Mange. It’s the best! Great article, but “Bourbon” vanilla does not refer to the use of Bourbon as the alcohol in vanilla extract. It denotes that the beans are from the Bourbon Islands: Madagascar, Reunion, etc. Plain old grain alcohol is used to make extract. Can’t find the vanilla paste around here and although I can order it, need it immediately! Can you substitute the vanilla for the paste at the same amounts? Thank you so much for your post about vanillla bean paste. My local farm market just got it in but I had no idea how to use it. Will have to put it on the grocery list to use for my Easter dessert. I discovered vanilla paste 8 years ago! It will turn your plain chocolate chip cookies into omg gourmet cookies!I use it in all my baking.